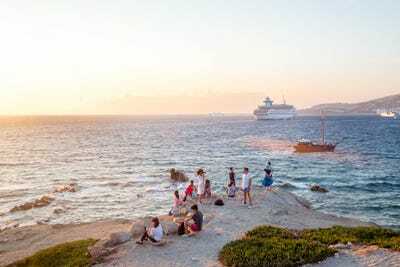 Harrison Jacobs/Business InsiderIf you don’t plan on spending a sea of cash, there are better places to go than Mykonos. 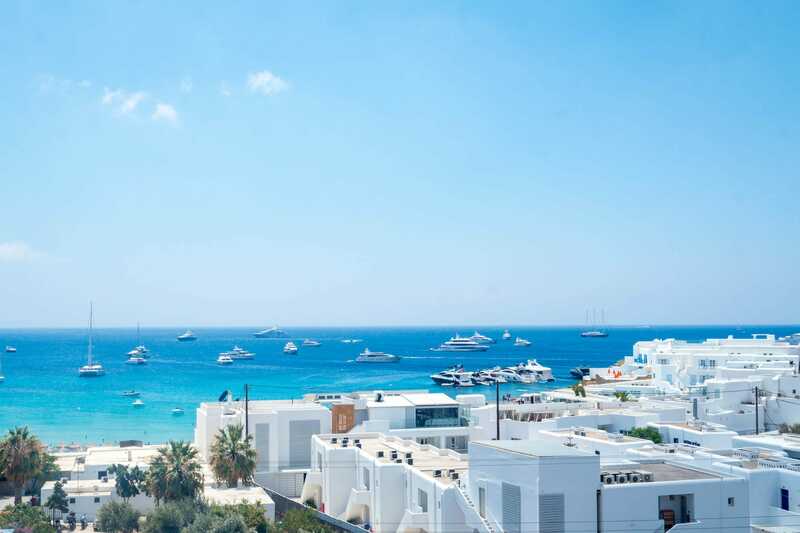 Mykonos is a Greek island, world-famous as a party capital and a popular vacation hotspot for millionaires and billionaires. 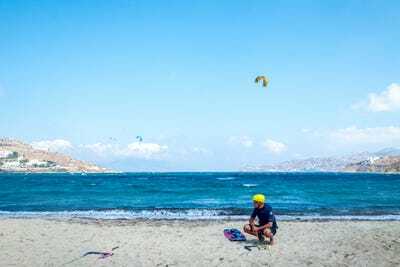 I recently visited to see what the island would be like on both a frugal cheap vacation budget and on a more mid- to high-end vacation budget. Visiting during the peak summer months of July and August turned out to be an expensive, exhausting, and crowded experience, with every beach packed, lines out the door of most clubs and bars, and resorts that were hard to book and cost a fortune. 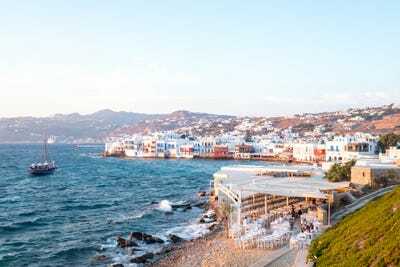 While the resorts and beaches are gorgeous and the bars and clubs fun and lively, Mykonos feels like poor bang-for-your-buck unless you are a hard-partying clubber or drowning in money. There are a lot of less crowded, equally beautiful, and far cheaper Greek islands to visit nearby. 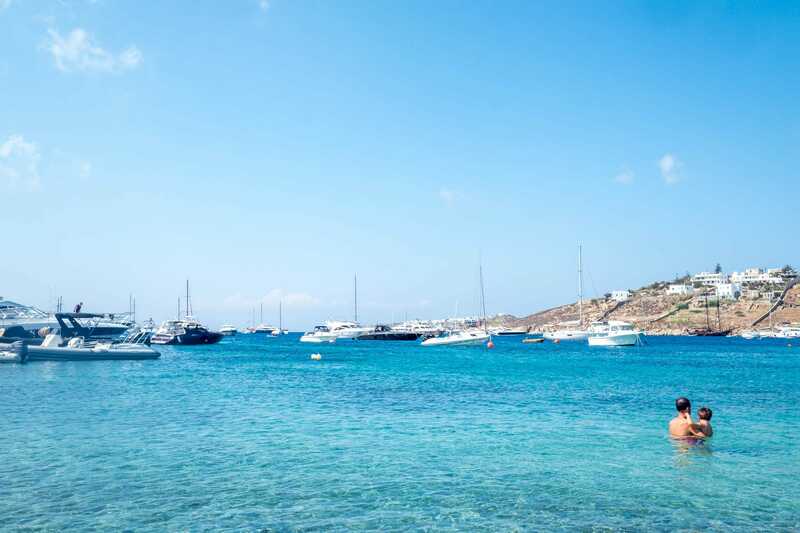 Mykonos is not for the faint of heart. The island is famous as a glamorous destination for the world’s most wealthy and famous. 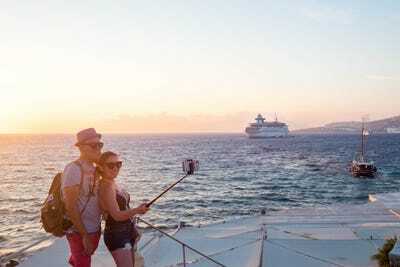 Come the booming summer months of July and August, the island swells with the A-listers, B-listers, C-listers, and D-listers, along with hundreds of thousands of vacationers, hard-partying dance-music junkies, and cruise-shippers. 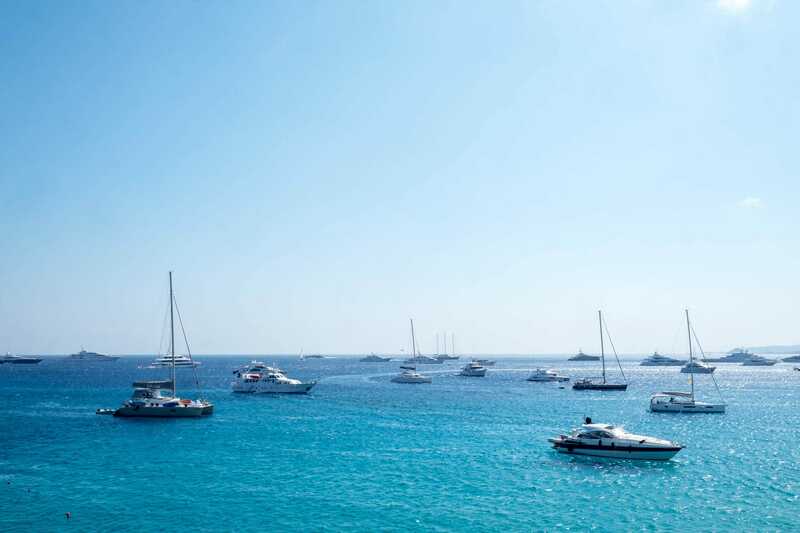 While just 33 square miles in size, the sunny and cool island is stuffed with hip boutique hotels, thumping beach clubs, haute couture shops, white sandy beaches, whitewashed alleyways, and swanky restaurants. If this all sounds a little like Ibiza, I’ll stop you right there: the cool rich kids have moved on. They’re in Mykonos now. 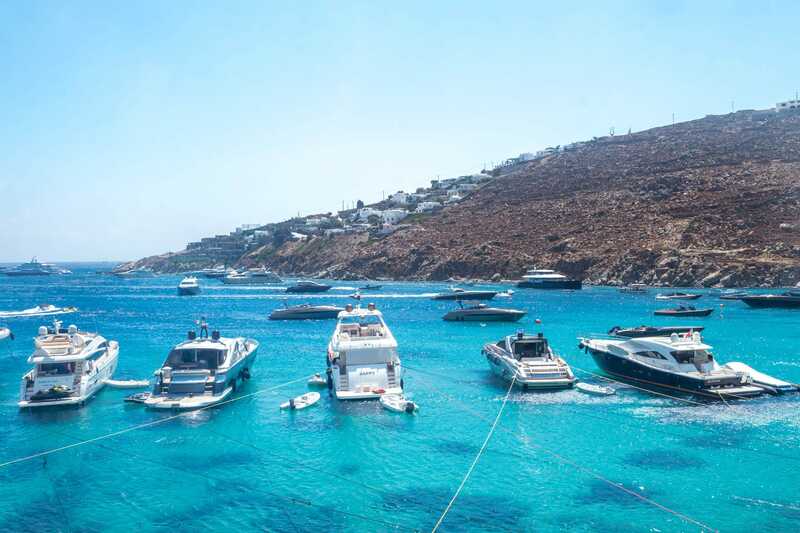 If there were any doubts, a look off any bay on Mykonos’ coast reveals waters swamped with freshly scrubbed yachts, superyachts, and mega-yachts. 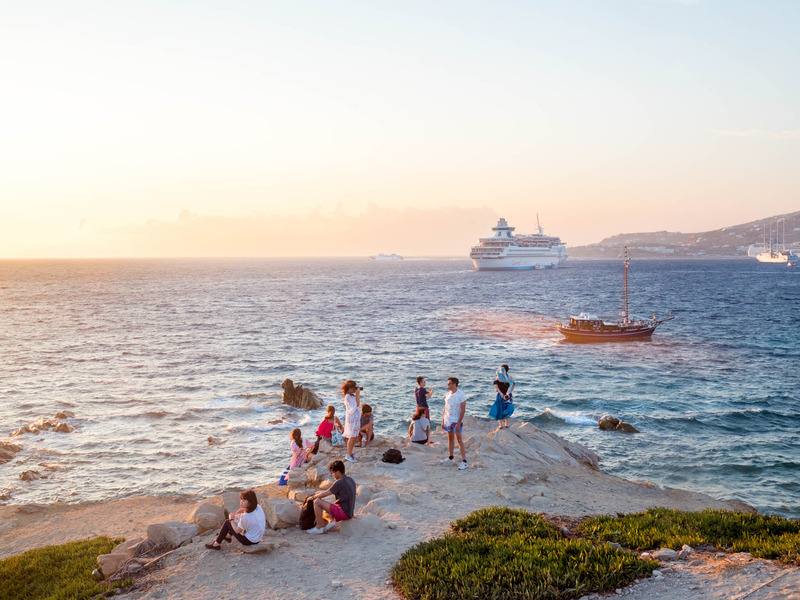 Over the last several years, the number of international arrivals to Mykonos has nearly doubled. But where does that leave the rest of the teeming masses that jostle for a spot at Mykonos’ glittering carnival? 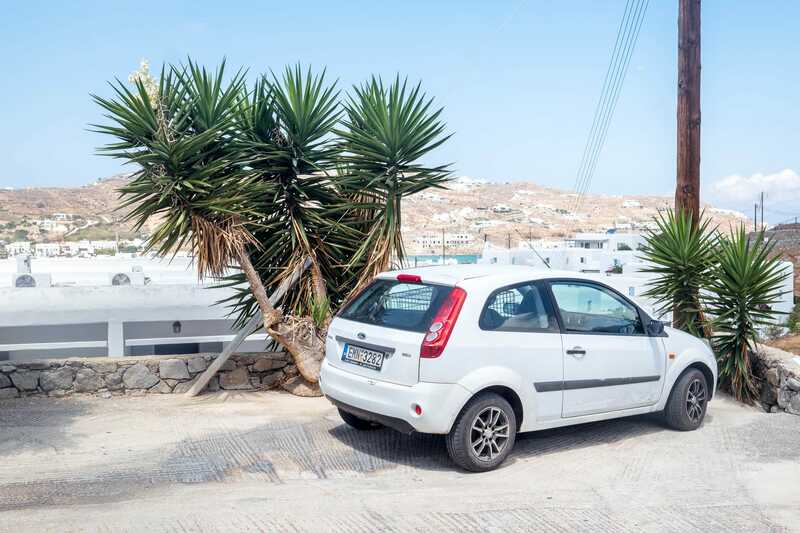 For us, visiting Mykonos is a far different experience. The doors that simply open for the likes of Leonardo DiCaprio, Richard Branson, Bella Hadid, and billionaire Stavros Niarchos III stay closed for mere mortals. A day at a beach club can empty out a savings account, and that’s if you can even score a cabana at all. In the hottest of hot spots, the staff only have time to cater to millionaires and billionaires. 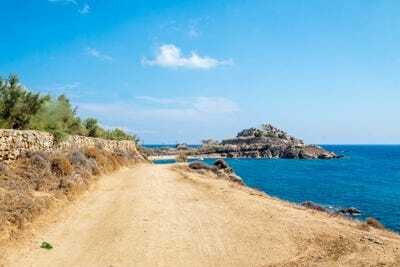 Those were my assumptions before I stepped off the aeroplane to see what Mykonos is like for regular folks – many of which I found were right by the time I left the island a few days later. Other expectations, I found, were pleasantly incorrect. 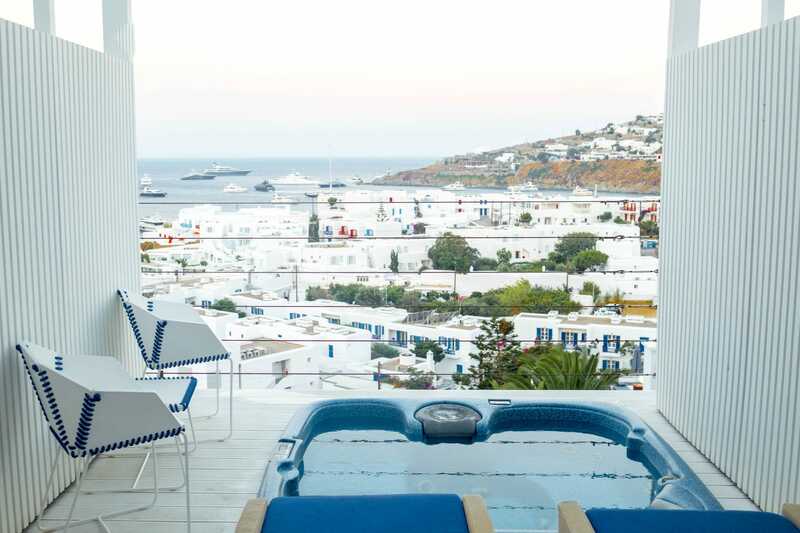 Gorgeous, glamorous, and luxurious, Mykonos is Greece’s answer to Ibiza. In the 1950s, the island was barely a blip on the map. But in 1961, first lady Jackie Kennedy visited, setting off the first wave of tourism from the world’s monied and famous. Grace Kelly, Elizabeth Taylor, Marlon Brando, and Rita Hayworth were just a few of the celebrities to vacation on the island in those days. In the following decades, the island became known as a legendary underground party spot and a popular vacationing spot for the global LGBT community. 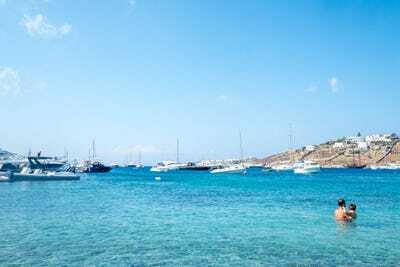 In recent years, tourism to the island has exploded as global partiers and a new generation of celebrities and the ultra-rich discovered the Grecian paradise after moving on from now-passé hot spots like Ibiza and San Tropez. I arrived on the island one evening in late July, the peak of the peak season. I was picked up by Michael, the driver for the guest house I would be staying at and a 50-ish “financial refugee” from Athens. Before dropping me off, Michael informed me of a few tips to survive Mykonos. Pay attention to the northerly “meltemi” wind, which acts like “natural air conditioning” but can ruin a night if you don’t carry a jacket. Mind the traffic: Roads are packed and there are no footpaths. Don’t expect to get a taxi. There are only 31 on the island and over 100,000 tourists. “It’s a lottery,” he said. You can rent a car or a quad bike, but with narrow winding roads, buses are the way for even those on a modest budget. To give you a lay of the land, on the first night, I stayed in Ornos for my try at frugality. On the second, I was in Platis Gialos to check out a more luxurious option. For my first night and day, I wanted to operate on a frugal budget. Of course, in mid-summer that’s practically impossible in Mykonos. 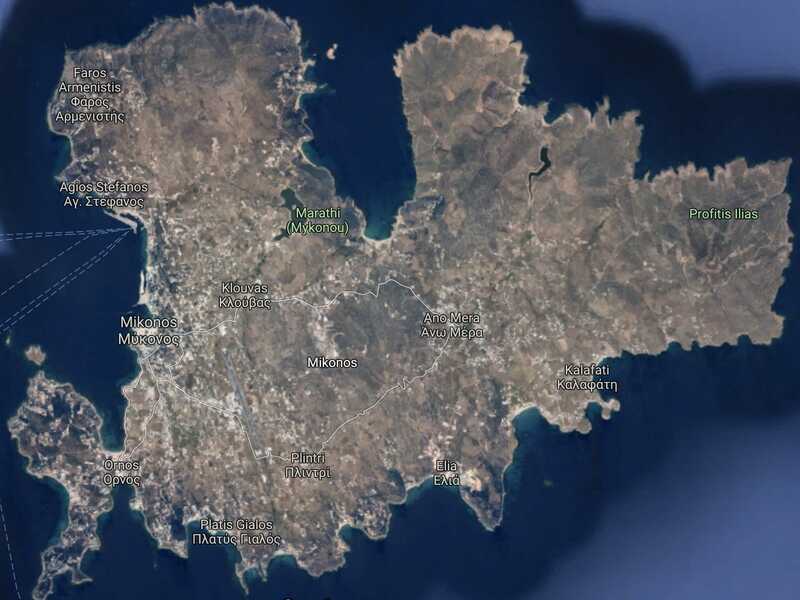 The cheapest (live-able) place I could find was the Marinas Studios, near Ornos Bay, for 110 Euros per night. 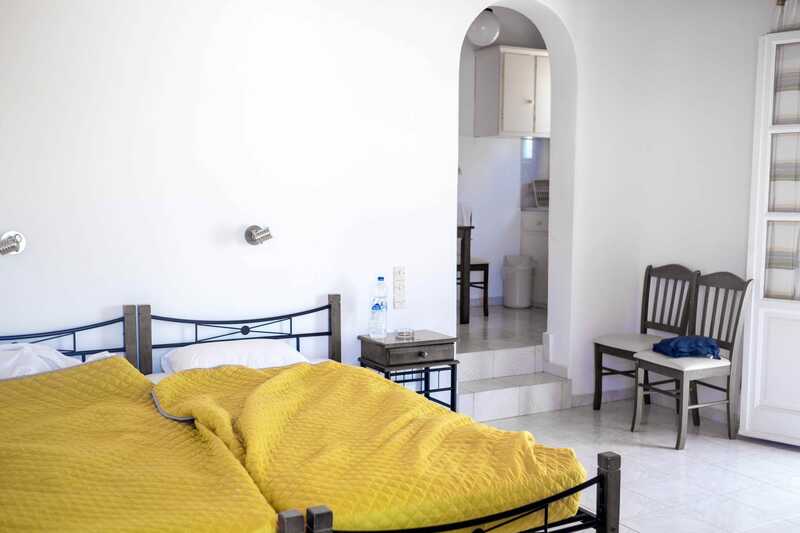 It was a fine basic room, about 10 minutes from Mykonos Town. The only thing cheaper was a camping hostel near the beach for 90 Euros a night. Reviews said it had bed bugs. If it’s not already clear, Mykonos is not the place to visit on your college Eurotrip, and maybe not for the family vacation, either. 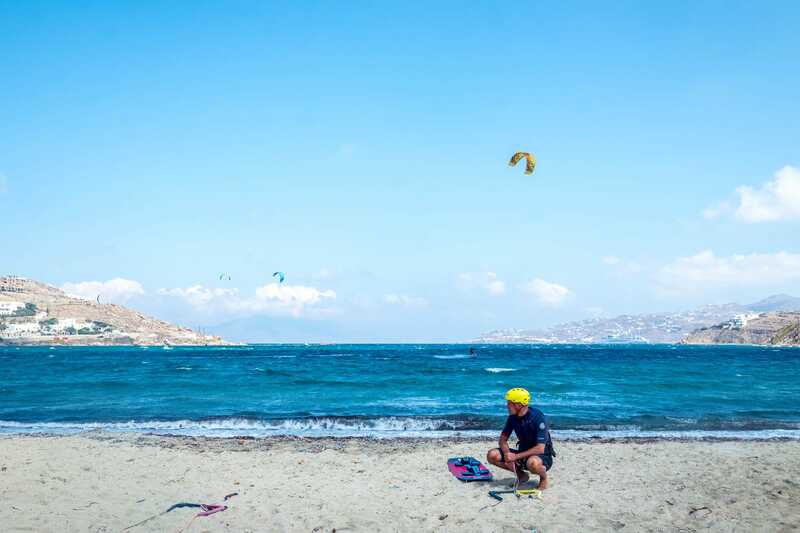 Known as the “island of the Winds,” Mykonos is famous for kite-surfing. There were a couple dozen people in the water at Korfos Beach whipping and flying in the forceful gales. It looked like a ton of fun. If adventure sports are your jam, there are plenty of places to make it happen on the island. 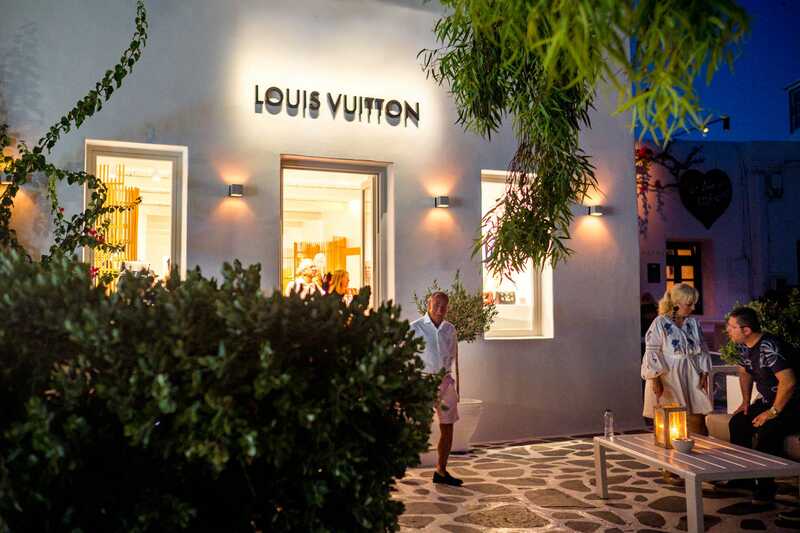 The first indication that Mykonos is a place for the rich hits you as you walk along the coast. 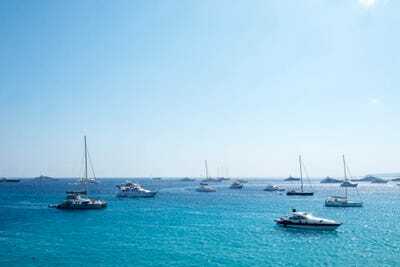 At just about everywhere I went to swim, there were boats and yachts moored a hundred yards or so from the beach. Many celebs, including Stefano Gabbana of Dolce & Gabana, dock their boat, party in Mykonos during the day, and then sleep onboard. 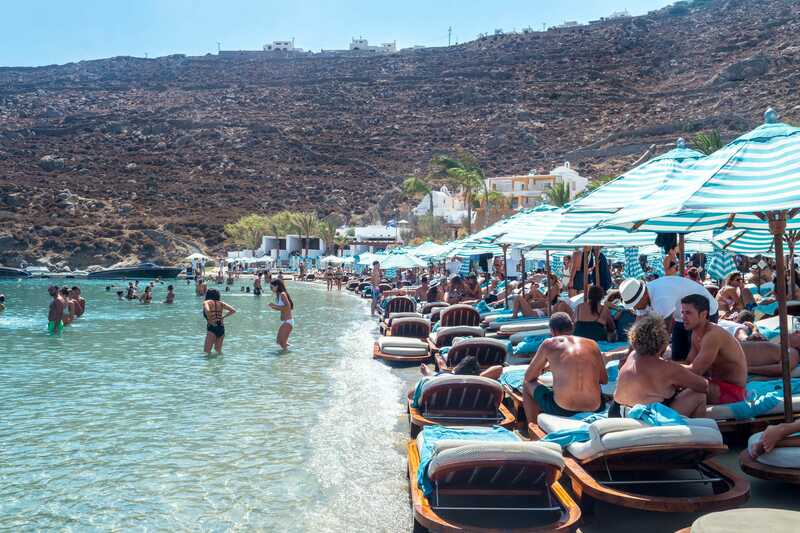 The first beach I hit in Mykonos was Psarou Beach, a notorious hangout spot for the likes of Russel Crowe, Kendall Jenner, and Lindsay Lohan, among others. From a distance, the blue-green waters looked like they’d been ripped from the pages of Vogue. Around midday, the beach was packed. Psarou Beach is dominated by Nammos Beach Club, which offers a restaurant, bar, beach cabanas, and a chummy party scene. 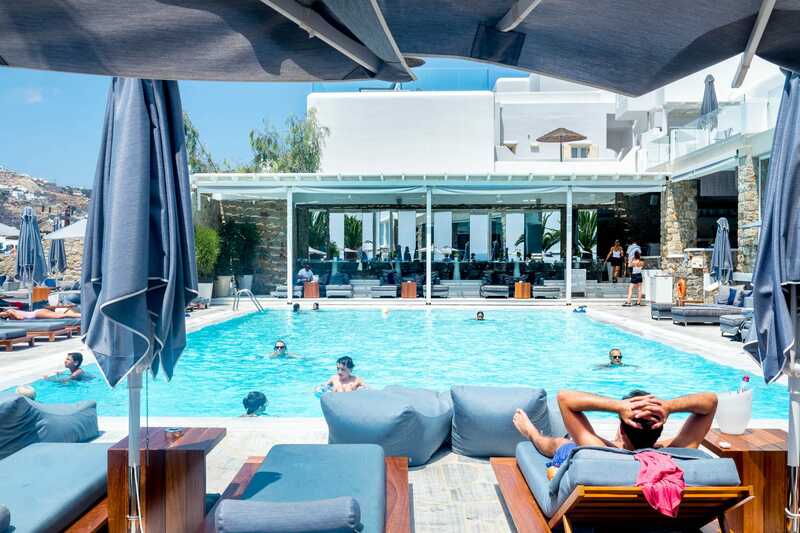 Those staying at the Mykonos Blu Grecotel Resort also get loungers on the beach. Rooms at the hotel start over $US1,000 in July. A villa tops $US3,000 a night. Nammos is a different beast. 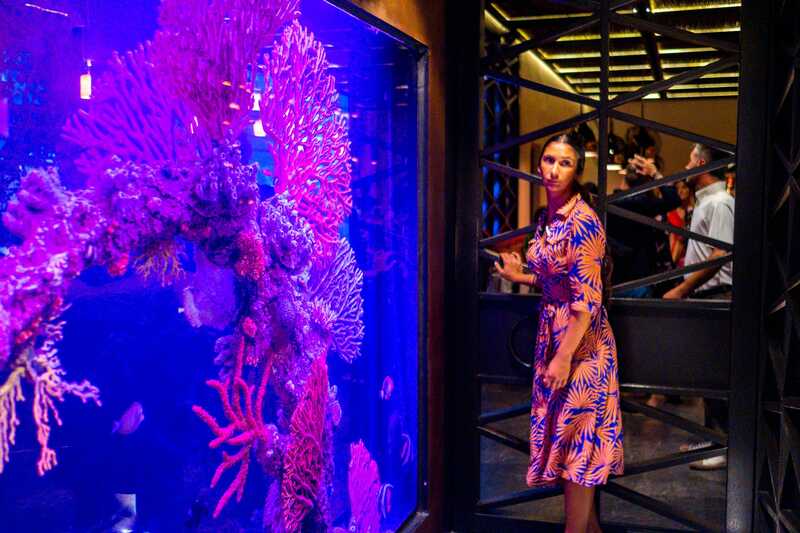 Known as a see-and-be-seen kind of place, its reputation as a celeb haunt — Lindsay Lohan and Tiffany Trump were partying there in July — pays off. The cool and hip and those desperate to seem cool and hip fill the loungers, which are so packed, they could survive a beach invasion. Many come just for lunch, but even that will easily run $US400 and up. When I looked, the waiting area was packed with wealthy vacationers trying to score a table. Mykonos isn’t an egalitarian place. If you look like the kind of person who drops thousands (i.e. big watch, Louis Vuitton bag, etc), staff will treat you like royalty. 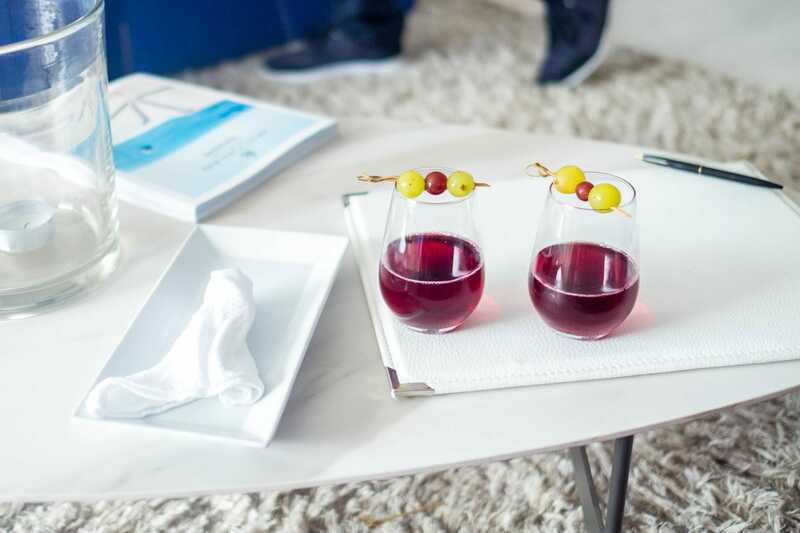 That attitude starts with the loungers. Don’t expect to get front row, even if you show up at 8 a.m.
Lounges are priced by the row, with the price hitting hundreds of dollars the closer you get to the water. A private cabana at Nammos can cost $US5,000 per day, and champagne can hit $US140,000 a bottle. If dropping a few hundred for a seat isn’t your style, there’s a sliver of public space at every beach. I laid out my towel there and went for a dip. The water was cool and refreshing on the sunny day, with the calm water just reaching up to my chest. But I hated that the view toward the sea was blocked by the armada of yachts in the distance. For dinner, I headed back to Ornos near my guesthouse. 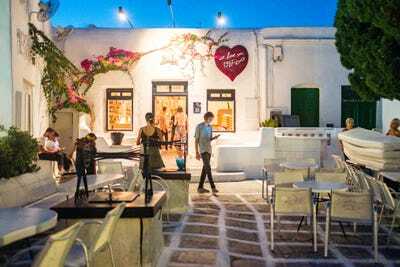 The village is well-known for having a number of excellent local tavernas at some of the most reasonable prices on island. I ordered a simple pork souvlaki for 10 Euros and a bottle of ouzo, a classic Greek anise-based liquor, for 7 Euros. Note to self: never order ouzo again. I drank half the bottle and got very nauseous. That fail is on me. The next day it was time to kick up my Myconian adventure to the next level. I decided to stay at The Myconian Ambassador Relais & Chateau, one of the island’s oldest and most luxurious resorts. Starting around $US600 a night in the high season (though much more for the nicest, sea-facing rooms), the resort isn’t quite where the millionaires and billionaires stay, but it’s certainly a nice spot for a well-off couple looking for some R&R. 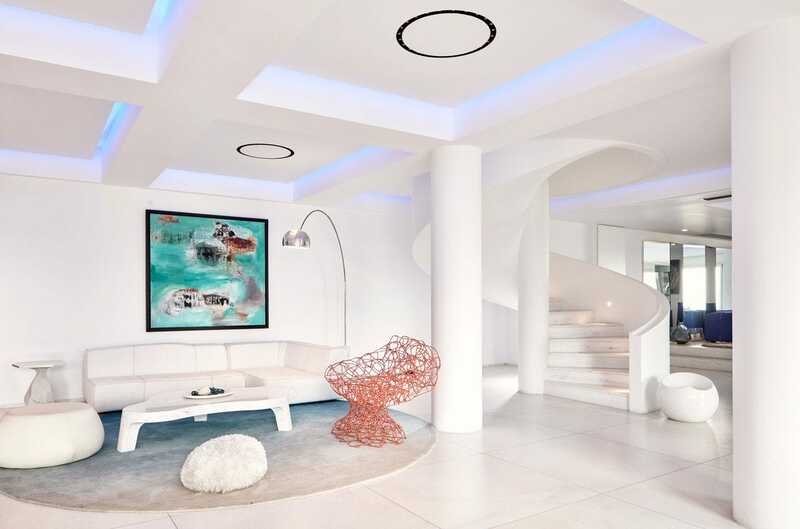 The Myconian Ambassador has all the elements of Greek island luxury: whitewashed curves, a stunning view of the sea, and private terraces with personal hot tubs. The view from the terrace and the pool overlooks Platys Gialos beach. 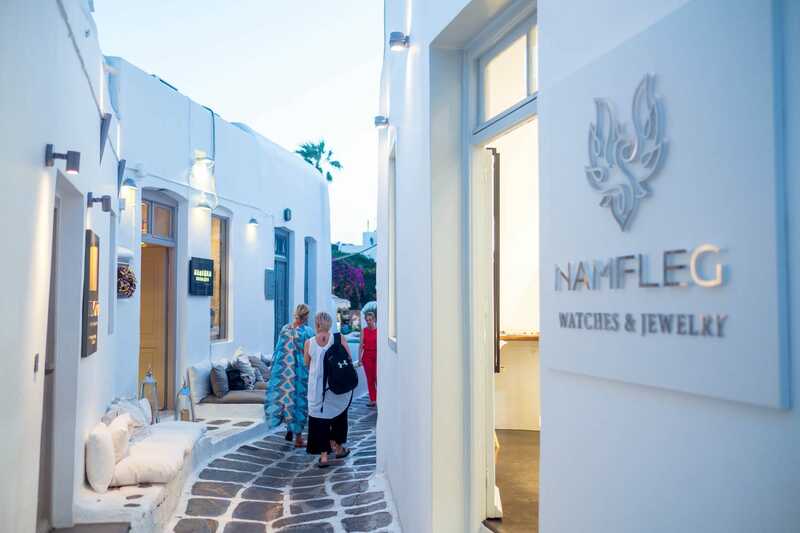 The ambiance at the property is calm, a welcome respite from the craziness on Mykonos’s beaches. When you check in, staff bring you a welcome drink. The pool at the Ambassador is so inviting it’s hard to even want to traipse down to the beach. The loungers are big and comfy with massive umbrellas to block out the sun while you thumb your beach read. The hotel offers a few nice touches, like a complimentary iced bottle of water at your lounger. Staff come around every so often offering complimentary smoothies or products from the spa to freshen up. The life of even moderate luxury is … good. Afterwards, I headed up to the room to change before checking out the nearby beaches. The room, called its True Blue double room, has a hot tub on the terrace with a view of the sea. While the terrace is unreal, the room itself is pretty standard. It goes for close to a $US1,000 a night in peak season. 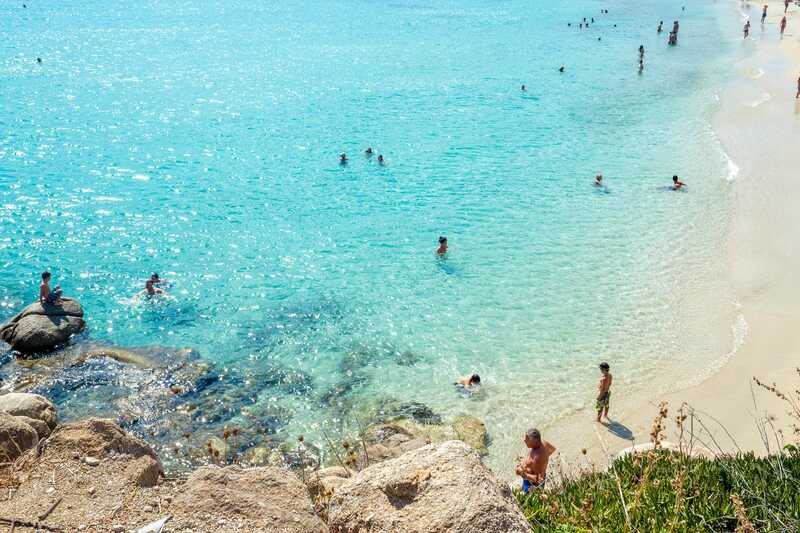 Platys Gialos, a short walk from the hotel, is known for being a slightly quieter, more family-friendly beach. 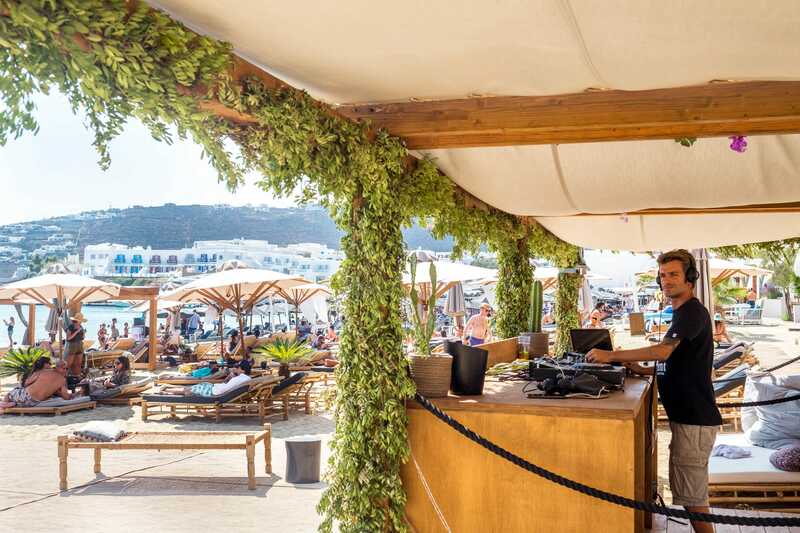 But, it being Mykonos, there is always a DJ spinning some tunes by the water. Platys Gialos is also known for being good for water sports, though I only saw people lapping up the waves. It’s a good time swimming in and around the rocky cliffs for a few hours. 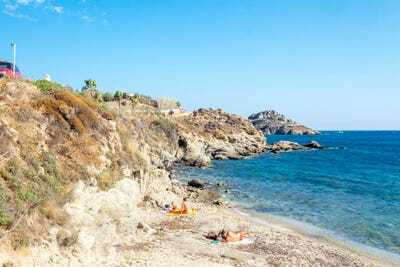 Most of the resorts are clustered around Platys Gialos, so for the people who don’t care about a beach party, it’s the beach of choice. Still, the water is marred by the boats that fill the seafront. I’m sure it’s nice if you are a millionaire or billionaire sunning yourself on your yacht. Many high-rollers island-hop from isle to isle on the comfort of their boats. Mykonos has 25 beaches strewn along its coast, each with a different vibe. The beaches on the island’s north coast are known for being much quieter and nudist friendly. I kept it to the southern side, which tends to have more clubs, restaurants, and beach bars. From Platys Gialos, I walked along the water. Along the way, there was this little strip of sand that I later learned is called Hidden Beach. There were a few people hanging on their towels and blankets. It looked like a nice, secluded place to enjoy the day. A little further down is Agia Anna Beach, which gets its name from the St. Anna chapel nearby. 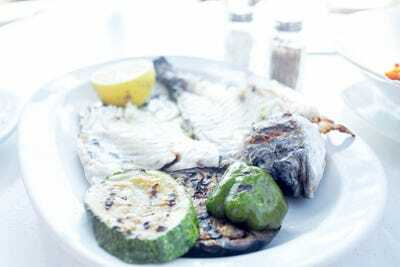 It’s even calmer than Platys Gialos and is home to some of the best tavernas on the island. 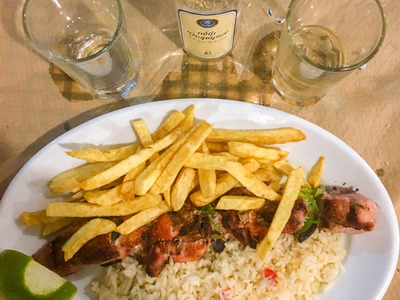 I went to Nikolas Taverna at the recommendation of the hotel. It’s known for being many people’s favourite place to get authentic Greek food. 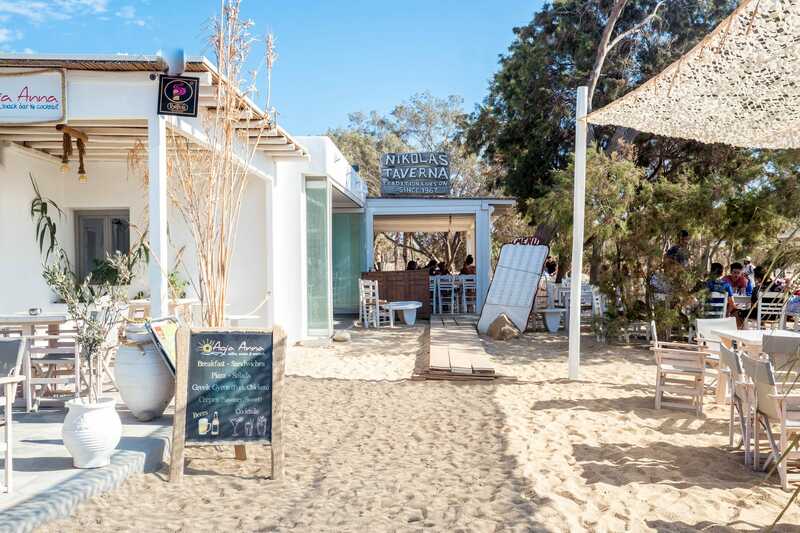 Open since 1967, Nikolas Taverna isn’t cheap, but, for eating on the beach, it offers some of the most reasonable prices around. 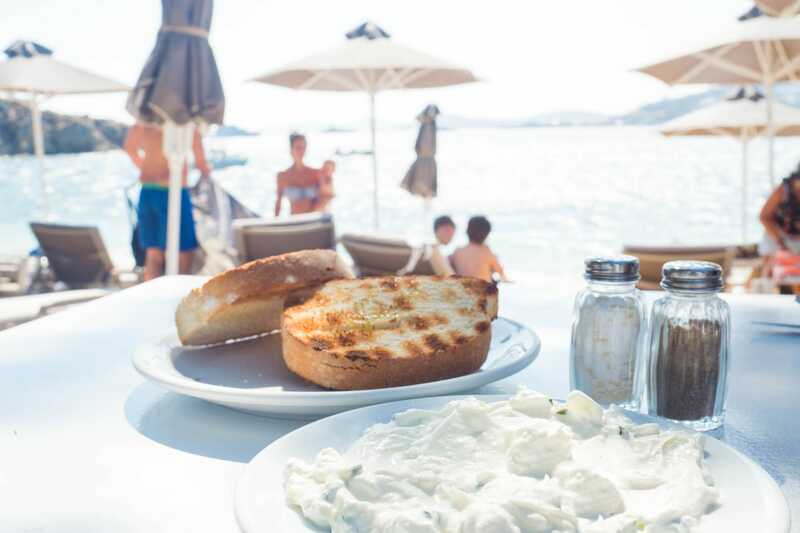 The thick and creamy tzatiki made me think I’ve never tasted the dip properly before. The dorado fish tasted like it had been just pulled from the ocean that day. Light and flaky with a nicely charred skin, the fish went perfectly with the grilled veggies. A few minutes away is the real party at Scorpios. 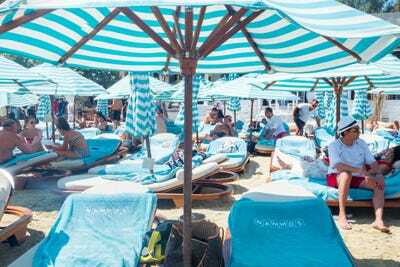 Only open since 2015, the beach club has quickly become the hottest and most expensive place in town. The club is known for playing pretty esoteric house music (think Burning Man-type sets) and is styled in Mediterranean-meets-Moroccan decor. But the place is also known for being packed, and for having a pretentious attitude whether you have a reservation or not. Parties are known to go from sunset to midnight. Afterwards, I headed into town to get a view of the sunset. It was packed with people getting ready for dinner and thousands of cruise-shippers taking a tour of the town. The sunset was, of course, spectacular. The sky was lit up into beams of gold, orange, red, and purple, as a cool breeze blew in from the sea. While a few people were sitting and watching the sunset, most were trying to get the perfect shot. One of the most defining features of Mykonos are its windwills, which are spread out around the island. The biggest ones overlook the main town. The Venetians built them in the 16th century to mill flour. 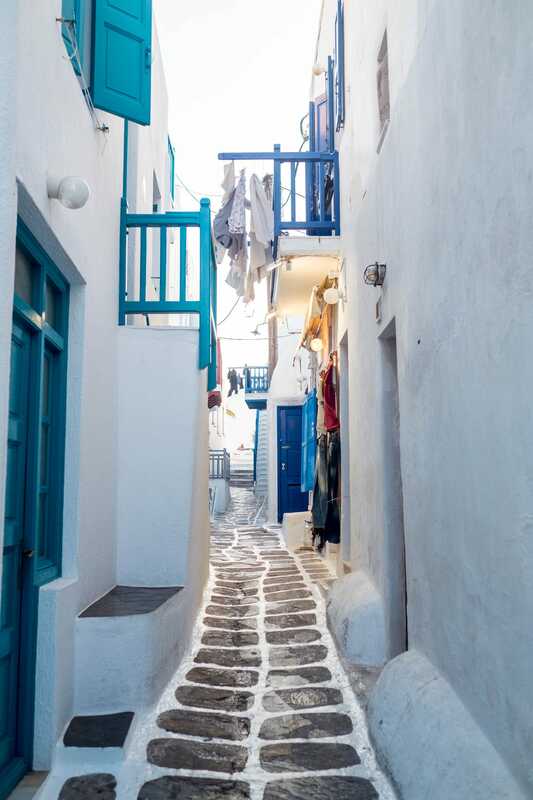 In general, the cobblestone alleyways of the town are packed from sunset until late into the night, as everyone descends to have dinner or do some shopping. But I had been told that you can always find an empty street if you wander a bit. No one seems to walk on the residential alleyways, so you can get a photo like this, too. The most popular place to watch the sunset is Little Venice, a row of fishing houses that line the waterfront. The area has since been converted into restaurants and bars, with chairs overlooking the surf, which frequently splashes up towards the seats. 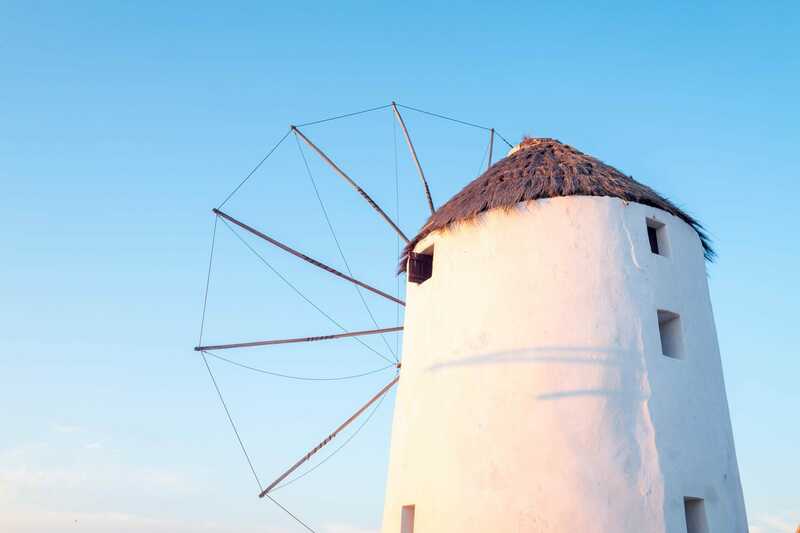 But if you don’t have a reservation or get to one of the restaurants super early, you’re better off watching by the windmills. 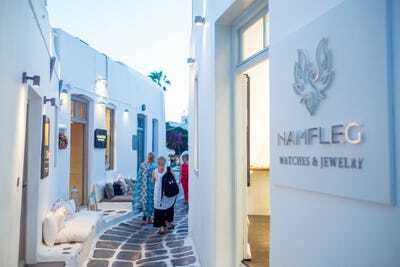 While there are plenty of kitschy souvenir shops to get a T-shirt or postcards, many of the streets are lined with luxury shopping from top international brands, as well as Greek designers. What would a luxury town be without a Louis Vuitton? 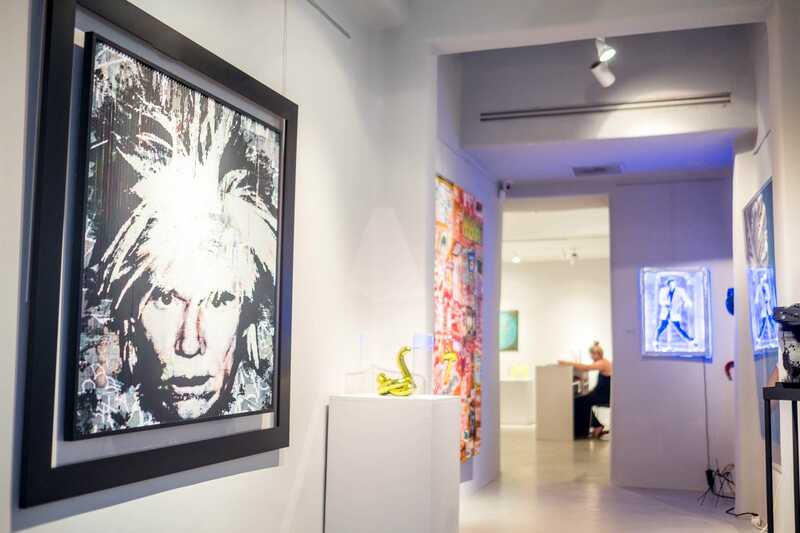 There are no shortage of art galleries to spend money. Gallery Skoufa is one of the oldest, having opened in 1981. It typically features Greek artists. 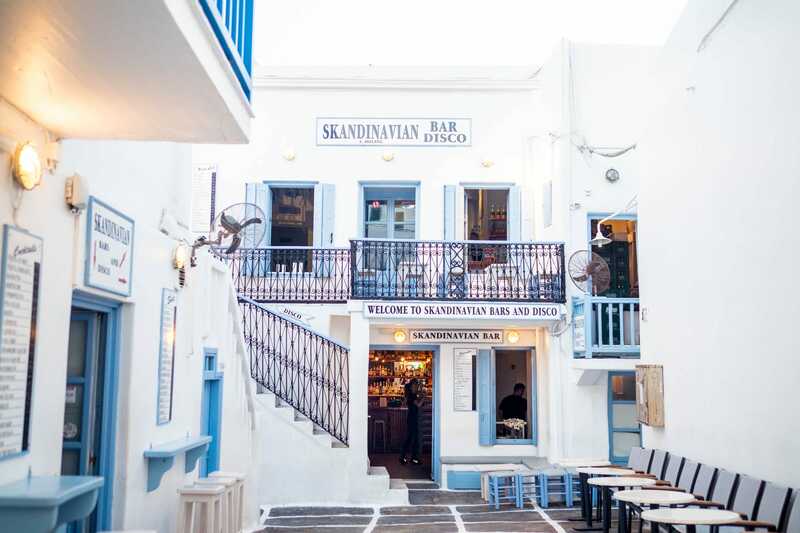 One of the swankiest places to eat dinner in Mykonos is Ling Ling Hakkasan, a Michelin-starred restaurant that will run a couple hundred bucks for two. But that’s assuming you get a table. Mykonos is not the kind of place to skimp on reservations. Unless you plan on eating at the corner gyro joint – which I did – call ahead. I started the night at Semeli Bar in Little Venice, which had a choice happy hour until 12:30 a.m. If it isn’t already obvious, people go out late in Mykonos. 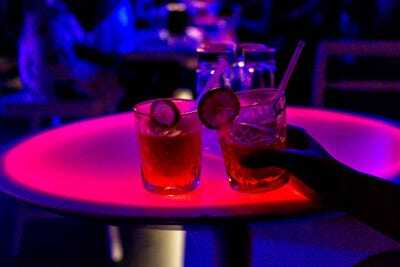 The bar grew steadily busier and the music bumped so loud that you couldn’t speak. It was a young, rambunctious crowd. As the night goes on, it turns more clubby. By the time I left, there was a line out the door. I took this photo of Skandinavian Bar and Disco before sunset as they were getting set up. By the time I came back around 1 a.m., this terrace area was filled with revelers and the dance-floor upstairs was popping. 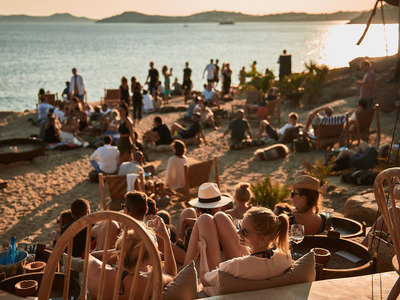 While not an exclusive place, Skandinavian has been rated one of the best places to party on the island since the ’70s. 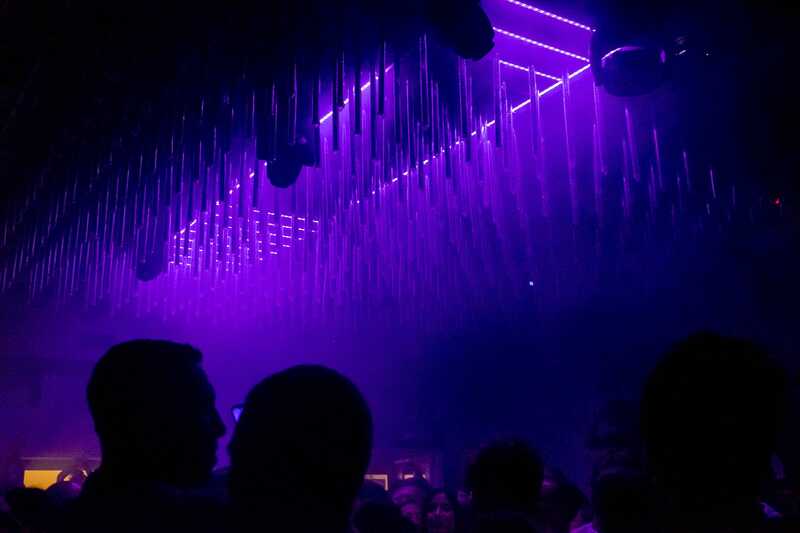 The light show on the dance floor is pretty impressive. The music tends towards mainstream electronic dance music and house music. You could easily lose a few hours dancing in here. I did. Located in the center of town for 30 years, Astra still retains its spot as a place to be. This photo was taken before the night got underway, but when I returned close to 3 a.m., the outside area was packed with the see-and-be-seen crowd. Astra has turned into a super-rich hangout spot. Unless you are buying bottles, you won’t get outside. And getting a tiny spot in the small interior will run you $US50 without a drink. I opted to hang in the streets and people-watch. It was good entertainment. 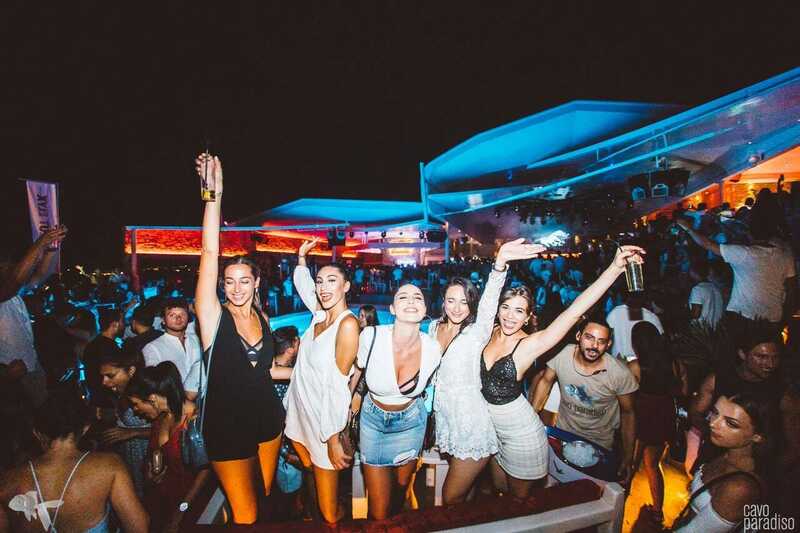 The top place to party in Mykonos until the wee hours (and the one that put the island on the map) is Cavo Paradiso, a 2,000-person open-air club on a cliff overlooking the Aegean. Tickets cost around $US30-60. Considered a legendary venue by international DJ superstars like Afrojack, it’s easily the best deal in town. You can get there via a late-night bus from town to Paradise Beach. After a long night of partying, many expensive drinks, and little sleep, I got a chance to see the sunrise from the terrace of the hotel room. If you’ve got money to burn, there are worse ways to spend it than on this unreal view. But then the hangover set in. The breakfast buffet, which only goes until 10:30 a.m., is a sight to behold at the Myconian Ambassador. The made-to-order strawberry and nutella crepe might as well be dessert, and the freshly made cucumber-apple juice was life-giving. I would probably still be doubled-over in bed if it wasn’t for those two items. Later that day, at the recommendation of a local, I hopped on a ferry to the island of Tinos next door. So what did I think of Mykonos? 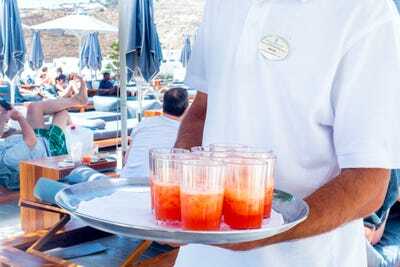 While generally I had a fine time during my few days in Mykonos, it felt like a completely different place since I wasn’t spending thousands of dollars. That could be said of lots of holiday destinations, but I’ve never felt that way in New York, Paris, the Caribbean islands, or other places I’ve visited. 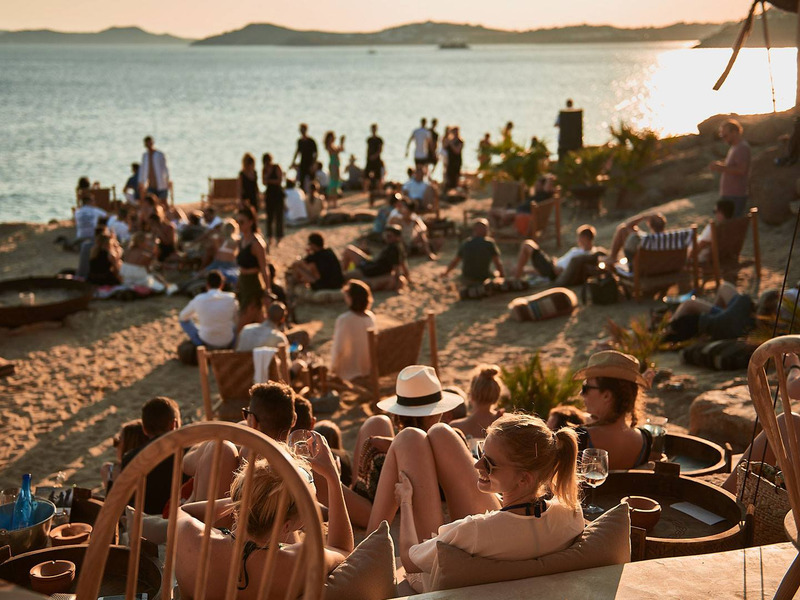 If you are a millionaire, billionaire, or even just a wealthy person who doesn’t care about blowing $US5,000 or more on a night out, the island opens itself up in ways that just isn’t the case for a regular Joe. Staff at the hotels and restaurants seem primed to ignore you unless they identify you as a high-roller. 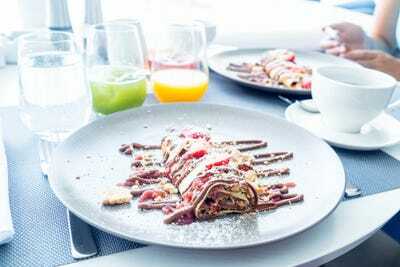 The top spots on the island are littered with reviews espousing a pretentious and exclusive attitude for even people on a modest luxury budget. That said, maybe exclusive isn’t the right way to describe it. If you have the money to spend, you can get in anywhere, which just isn’t the case in certain rarefied places in New York or Miami. 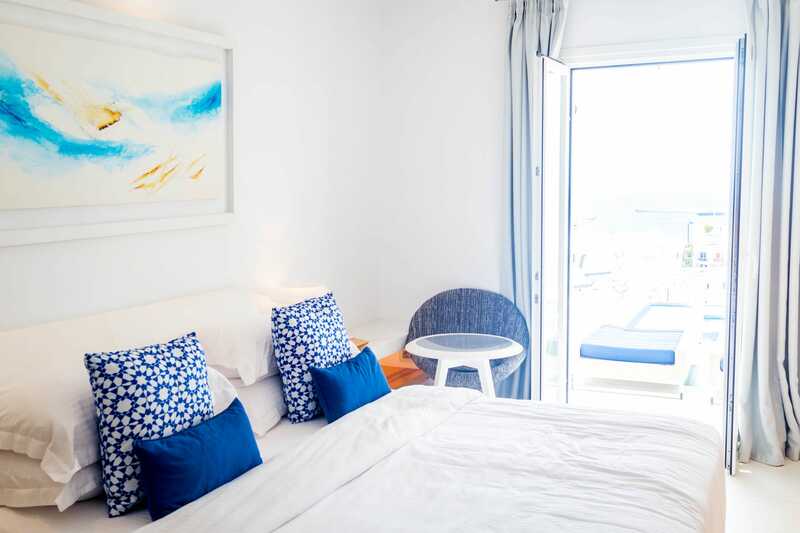 The island is beautiful and, with 25 beaches, you can find one that suits your preference and price level – it just may mean that you are sitting on your towel while the big shots pop champagne from cabanas nearby. I hated that there were 20 or 30 yachts spread out in front of nearly every beach on the southern coast. It makes you feel like you are swimming in a marina. I’m sure its nice for the super-rich, who can hop a tender back and forth to the beach party, but it kills the vibe for everyone else, in my opinion. Lastly is the trash. The island is packed in the summertime with hundreds of thousands of tourists. One thing I didn’t expect, but maybe should have, is that tons of places reek of a hot garbage smell and the grass is littered with empty bottles. I’m sure the people going from private car to beach club to villa don’t see or smell it, but, for the rest of us, it ruins the relaxed experience. After spending the next few days in Tinos, a quiet nearby island, I felt like I probably don’t need to come back to Mykonos in the near future. 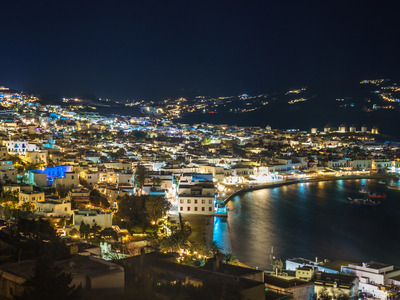 Tinos, and other quieter islands in the Cyclades, are half the price and just as beautiful. What’s interesting is that I heard from some repeat visitors that the VIP atmosphere is relatively new. 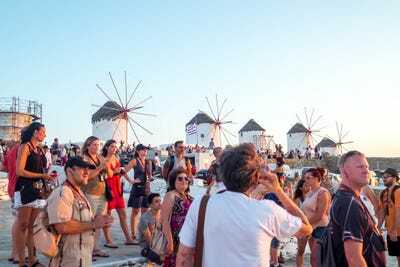 People used to come to Mykonos to escape the closed-off air of places like Ibiza or San Tropez and party in a bohemian atmosphere. That wasn’t the vibe I got. Mykonos is the place to go if you are looking for a party, but just be prepared to spend mightily. If the dance music see-and-be-seen carnival isn’t what you are looking for, don’t bother. There are plenty of other Greek islands that will give you more bang for your buck.